Marian Olson is strongly identified with the New Mexico area, but she essayed a broader and more rural context in this early chapbook from Honeybrook Press (1992). Illustrations by Alice Noera. The Haiku Foundation does not have a copy of this book, and would greatly appreciate a donated copy so that we might offer the entire book in the THF Digital Library. All haiku in the Book of the Week Archive are selected by Tom Clausen, and are used with permission. Sweet memories and lots of smiles… these haiku make me grin big as I remember too! My mother tended those chickens in Marian’s yard– a memory bonus for me as I read her clean, refreshing haiku. Marian continually captures the timeless in the particular—“just this.” She really takes us into the chicken yard with these poems, and takes me back to remembered childhood visits to my Grandpa Harter’s farm in South Carolina: running barefoot through the dirt while scattering corn, chickens clucking and running all around me. And yes, the gathering of warm eggs. What a wonderful meditation these poems offer us! This work takes me back to my childhood. I would spend hours sitting, watching and singing to our chickens. Happy times. I knew each one of them and named then crazy names. I love Marian’s work and look forward to reading what she writes in the future. I love these. I just finished a stint as a “chicken sitter” for some urban chickens and it was as if Marian Olson were looking over my shoulder. Such a perfect observer. She got it just right. I won’t ever again think tending chickens is a mundane activity. / no worry disturbs me” such a simple yet deep resolution here. Thank you Marian for such a superb collection! For me, this book was a journey back to Grandma Betty’s farm and her chickens, which my brother and I got to feed. Then there were the Easter chicks we raised to adulthood. Marian knows whereof she speaks as speaks for all chickens and for those of us who have developed affection for these fowl. published (a good reason to keep a feature like this alive). Two of my favorites: “click of the gate/chickens hurry to see/what I brought” and “sundown/the last chicken vanishes/into the coop.” The words and images are so simple, but convey energy, resonance, and true chicken nature, which I as human can enter into and identify with. That’s the beauty of haiku…..in the stretch of a moment, we can be spirited off to other micro worlds, even that of the chicken coop. By the way, the house we live in (in the middle of the city) came with an abandoned chicken “house.” When the boys were young they took it as a club house and with their friends painted a board and nailed it above the door. The sign read, “No girls AllowEd!” What a hoot! A few years later, our younger daughter and her friends reclaimed the space. Now I use it as a writing corner….a very fertile place. Thank you Marian! I’ve always thought that “Songs of the Chicken Yard” was one of the most important individual collections of haiku yet published in English. It has an unlikely subject, but Marian does an excellent job of making it work. A lot of good haiku books go by, but this one definitely stands out, not even counting its lush production values. I’d love to be able to write a haiku book as strong as this one. In so few words, Marian Olsen stimulated memories “laying” dormant since I was a little boy in Colorado (nearly 70 years ago) when my Grandmother insisted that I go collect eggs.The ruckus that some, broody, hens used to intimidate was frightening at first, but then the discoveries — the eggs were warm, the hens were soft, and my Grandmother was proud of me. Thank you Marian for these memories. Reading Marian’s Songs of the Chicken Yard several times over yielded new delights with each successive pass. They were particularly enjoyable to me as I am recuperating from minor injuries I suffered while taking eggs out from under a hen that was fiercely determined to sit on them until they hatched. Note: beware of broody hens! I am thrilled to take any journey Marian offers to share through her poems. Her insight into a deeper truth hidden within even the most common objects and occurrences could only come from living in the now and appreciating all that is there with you. She doesn’t only make me wish to share her experience, she brings me along with her to a place of fascination, empathy, and laughter. I can’t wait to get my hands on Moondance. ”click of the gate” is the haiku that opens a gate of memories for me. I love Marian’s book. It’s a classic, with some of the very best haiku written in English. Because of all my meanderings, I no longer have a copy of the book [or many other books], but it’s indelible in my heart. So’s Marian. I enjoyed Marian Olson’s haiku too. Her new book sounds lovely. I admire Lidia’s art as well – many years now. Charlie, since you broadened the discussion to new books – always love new books! – may I mention your wonderful A FIVE-BALLOON MORNING (2013, Red Mountain Press; Sante Fe, N.M.). Also, this week I received HAIKU in ENGLISH: The First Hundred Years. Edited by Jim Kacian, Philip Rowland, Allan Burns. Introduction by Billy Collins (2013, W.W. Norton & Company). Looks great and I heard there was a reading at Haiku North America. Back to Marian’s haiku: they bring back good memories of visiting a family farm in southwestern Wisconsin when young. 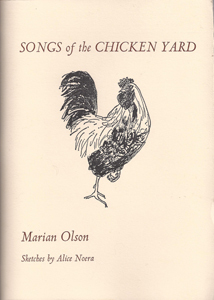 In Songs of the Chicken Yard Marian did a very daring thing in compiling a collection of poems focused on such a narrow topic, life in the chicken yard, and pulling it off! Actually, this book was written in California two years before Marian moved to New Mexico, but it’s a masterful collection that resonates far beyond any one place or the chickens themselves. I’m trying to think of other excellent books with themes as specific as this, and two by Karma Tenzing Wangchuk, 90 Frogs (1999 and 2002) and Stone Buddha (2009) come to mind. I have been following, and admire Marian Olson’s poetry for years and here find her knowledge of chickens a life’s observations. I know more about the life of a chicken now that I have read her haiku about chickens. I near had tears: “good-layer/enters the coop to lay/her last egg. Having had a chicken coop in the back yard growing up in the 40′ & 50’s in Waterville, Maine…Marian Olson brought back memories that lay hidden and this did bring tears of time passing to my eyes. Good haiku/senryu/tanka make you feel and her’s here, all on the life of a chicken, made a few tears appear with the remembering with: “just this/hacking water from ice/as chickens wait. I too have hacked ice from the water pail left out to give to the chickens. A beautiful presentation, and I loved the entire cover presentation. Kudos, Marian, well done! Robert Henry Poulin, your cherished friend. The haiku brings back such nice childhood memories (my Dad always raised chickens.) And I find myself thinking about the haiku and the sequence: finding the deeper meanings. Thank you!